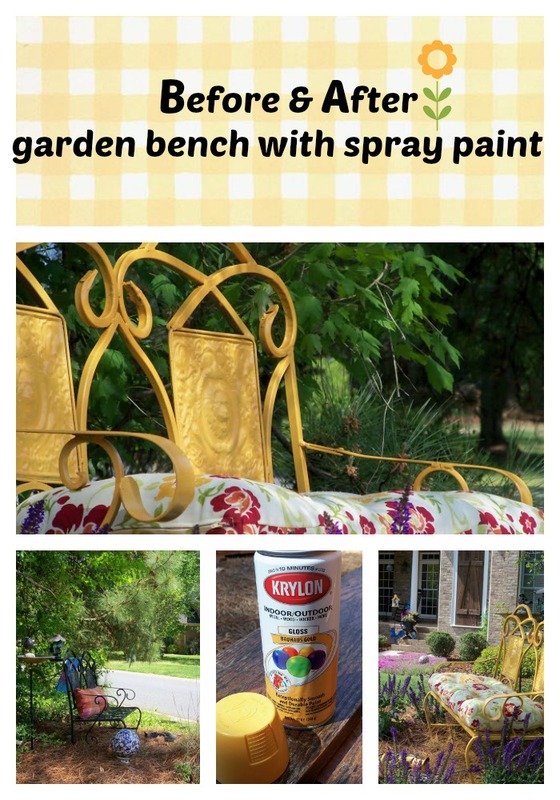 Garden bench spray paint before and after. What a difference a little spray paint can make. The Before Look, some of you liked it black. In the past two weeks I have bought about 10 cans, $2.97 a can, and I painted how many things….I will get back to you on that! this bench took about 2 1/2 cans. Well worth the spray and effort. And all these years later, here is the garden bench in a new location and of course a new color! Debbie, I love the yellow on that bench better than the black. Look how it just pops!! I have purple and white salvia I planted for the first time last year and it has come back strong and getting little buds. I'm loving your creativity. And so fab chic…and you are a designer queen! On the other hand…I am wondering if they have spray paint rehab for you. You aren't huffing the paint are you? Just kidding. Anyway…gold is the in color for huffing. LOL. It's so charming, Debbie! Now you can really see it when you look at the yard- I'm inspired! It's lovely in yellow, along with the rose, and purple salvia flowers. I love it!!!! I knew it would be fabulous yellow!! The cushions are gorgeous and what a statement it makes! I have got to do something. I have slept all morning since company left, but it is too beautiful to not get out today! Debbie, that looks so great. I bet people just drive by your house and are dying to come in and see what the inside looks like! Love…love…love! The yellow is perfection! It jusy pops in your beautiful flower bed…I adore all of the color you use…it makes me happy:)! Oh my gosh…I was one that was on the fence about changing the black but you have vision….I LOVE it yellow, again everything is so darn happy, just makes me want to fly clear across the U.S. to sit with you for coffee tomorrow morning! Oh, I love bright colors in the yard! I spray paint my outdoor "things" every year. Sometimes changing the color, sometimes not! So bright and so beautiful!!!! Lady Banks looks lovely! So beautiful- your garden is one to vie for! I like both black and yellow. Black had this antique look. Yellow looks regal. Very pretty! I'm going to watch out for all the fun stuff you do when i come back. Love that bench!! Where did you get it? I'm looking for a bench and wanted something just like that! Great color, makes me smile!! Oh I just love roses and the one in your photo is just beautiful. I so wish we lived somewhere that greenery would flourish instead of somewhere only desert plants do well! I love the yellow – so much more decadent than black, I think you have set a new trend! I thought it was Lady Banks! I am loving, loving, loving the yellow you painted it! Oh I love this color…I may pick a can to do some frames! No way!! I'm OBSESSED! Love it love it. You have adorable style. I have a lady banks rose vine. It is on the downside. We get to enjoy it for about three weeks. The next heavy rain will clean it off of blooms i'm afraid. 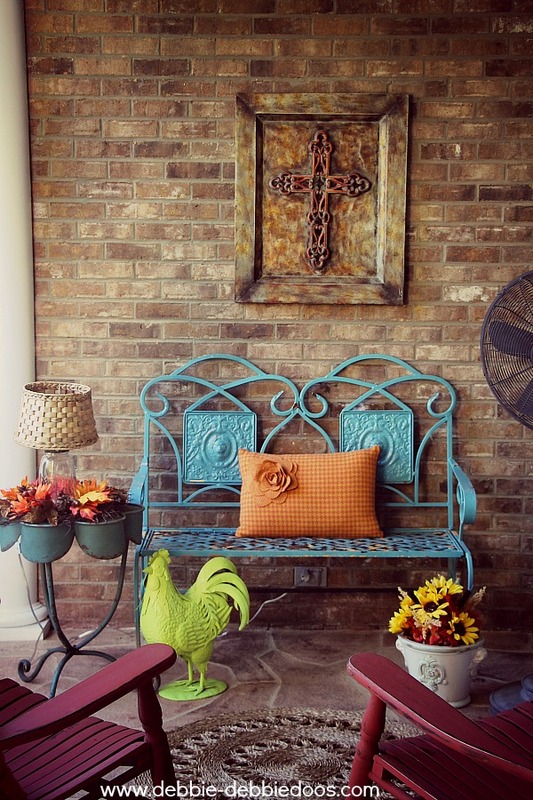 Love your color touches around your house. I am looking for an iron bench for out front. i like the black, but I LOVE the yellow~so pretty & unique too! That bench came out so nice. I love it. Hi Debbie — what a charming beautiful blog!! THanks for joining our Friday Finding Beauty — but remember please to link to OUR blog with your specific link — not your general blog. Its a great way to have people come visit others who are finding beauty. You certainly are the definition. I liked the bench black, but LOVE it yellow….great pop of color. I tend to go for the easy…black…but looking to snap out of it and add some color…your yellow and your blue is inspiring. oh you lucky duck! i love that bench & YELLOW is one of my all time faves. you must be thrilled with the results, because it really looks awesome. and that cushion & fabric with the yellow is delish! enjoy the view from your bench! Actually, I like it better in the gold! I love the cushion you have on it; it picks up the color wonderfully. Very pretty! Beautiful! Love all those colors. Great transformation. Wow the color is stunning! Looks perfect in the little garden nook! Stop by the Sunday Showcase party if you get a chance. I love this transformation – great job! I've bought several cans of Krylon spray paint, and it drips ~ I've never had that trouble with any other brand. Anyone else have that problem with it? Thanks everyone for stopping by…I did not have a problem at all with the Krylon paint…I did have to shake it a lot, and one can does not go as far as I would have liked it too…..but other than that I had no problem…. The bench looks so much cuter in yellow, nice redo! I think the bench looks so pretty Gold and I love the cushions! Absolutely stunning. I love, love, love the yellow. Brilliant! I love it! And I think I recognize that cushion from the Walmart Better Homes & Garden line. Isn't it cute? I bought the plates. WOW! I love the yellow and the fabric of the cushion, so great!! Luv the POP of YELLOW and your cushions are soooo cute! Hope you had FUN at NTT! I do love the black but the yellow is better!! Looks really nice with the purple Salvia. That bench rocks. I love the yellow. Very inspiring. That yellow is the bomb! I am going out and buying some today to spray my patio set! Love it! Again, Debbie, you are trluy inspiring me to go crazy with this color!! I am IN LOVE with that bench. The color is amazing!! Wow, I've got to pick up a can and add some pizzaz to my yard. Thank you so much for linking to Woo Hoo! Wednesday and joining the party. Grab a glass of wine and enjoy! Loving the bench and loving the color! oohhh..that yellow is divine. Love the brightness it adds. You have lots of flowers in bloom to be one who doesn't claim to have a green thumb. Beautiful yard! I love this chair in the yellow. It was lost in it's surroundings when it was black. Now, it stands out and has a lot more personality. Great choice! This looks great yellow! and the cushion is perfect! The purple salvia and yellow bench look so nice together. that yellow bench is way adorable painted . so cute and sunshiney! I like the "after" better. And I am not usually a fan of yellow & I love black. But the bright color really makes it pop out in your yard.